The latest addition to my little family of Athenian Mysteries. This is #4 in the series. 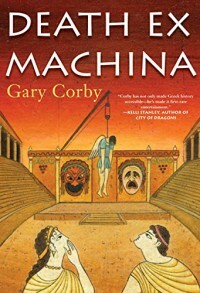 The title is a pun on the literary device called deus ex machina. Deus ex machina means a story in which someone or something suddenly appears to wind up the plot very quickly. Death Ex Machina on the other hand means someone has died. Now our heroes have to find the killer.